The final phase of the SME Maxmiser Development program will take the industry education and strategic development process from the previous phases of the program to give participants the opportunity to engage with Operators and major contractors at a speed networking event. Selected representatives from these companies, including commercial and procurement teams, will meet with the SME's to allow a comprehensive overview of local capability and service offering available from NT businesses. Registration for the Meet the Buyer event is strictly limited. To be eligible to apply, businesses must have a local office with at least one representative based in Darwin or be an existing PCNT member. 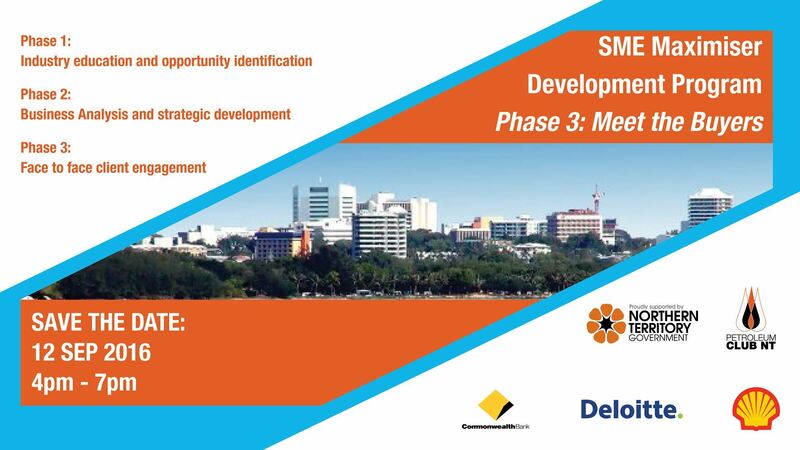 Preference for the event will go to PCNT members and businesses who have participated in previous phases of the program along with supporting member organisations. Please complete an expression of interest form for consideration and confirmations will be made as soon as possible. It is recommended you have 2-3 representatives from your business to attend as an SME networking team. Cost for the event is $150 per person and includes drinks and canapes. An additional program entry fee of $200 may apply if your company has not previously participated in Phase 1 or 2 or the SME program.